Concrete is a very strong and resilient material and is an integral part of any landscape project. These outdoor spaces of your property are largely exposed to the elements which make it crucial to use materials that will be long lasting too; concrete pavers fit the bill perfectly. These pavers have an interlocking design and are available in a variety of colors, shapes, styles, and designs and are ideal for patios, decks, poolscapes, walks, paths, and more. Natural stone paving has been around for centuries and is a material that’s stood the test of time. If you are wondering which flooring material you should use in the outdoor areas of your property, stone pavers are a great option. You can choose from materials such as flagstone, bluestone, sandstone, travertine and more. Brick paving is ideal for almost any outdoor space. Today, you can opt for brick pavers of different colors rather than the standard brick red. This lends a very unique and attractive look to the landscaped areas of your home. Brick paving is resilient, long-lasting and very easy to maintain as well, which makes it a great material for your landscape project. Many people like the look of natural stone in the landscaped areas of their home and there are a number of different types of stone to choose from such as sandstone, bluestone, travertine etc. But many people prefer flagstone pavers. These are very strong, look great in all types of settings and last for a very long time with the least amount of maintenance. Pool areas see a lot of water and that makes it important to choose the flooring material with care. 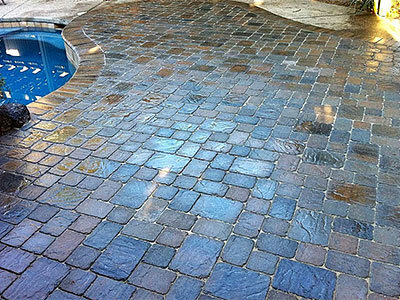 You can choose from pool pavers made of brick, concrete or natural stone. Materialssuch a travertine are porous in nature, which provides a non-slip surface to walk on; this is a distinct advantage when it comes to installing pavers in a poolscape. These pavers would have to be installed by experts as that helps avoid problems such as rising sinking or shifting. Its also a good idea to get the surfaces of the paver units sealed. If you are planning on getting any paver work done on your property, you want to make sure that the company you hire would be able to provide excellent, customized solutions and this is where local companies such as LR Landscaping & Pavers come in. They will provide you excellent paving solutions, at a very competitive cost.